I started by roasting the beets. I cut off the tops of the beets, washed them, and them wrapped each one tightly in aluminum foil, place in a baking dish and bake for about 45 minutes at 375. Beets are done when you can insert a fork with ease. Allow to cool for a bit and then peel the skin off the beets under cold running water, and then roughly chop them into one inch pieces. In a large pot, heat 2 tablespoons of olive oil. When the oil is hot add a large pinch of cumin seed – crumble the seeds between your fingers a bit when dropping them in to release extra flavor. Add a pinch of celery seed, and another of lemon thyme. Toss the spices in the oil for about a minute and then add a chopped onion. Cook until onion turns translucent and then add the chopped tomatoes, stirring frequently. After about 2 minutes, the tomato should have cooked down a bit and released its juices. 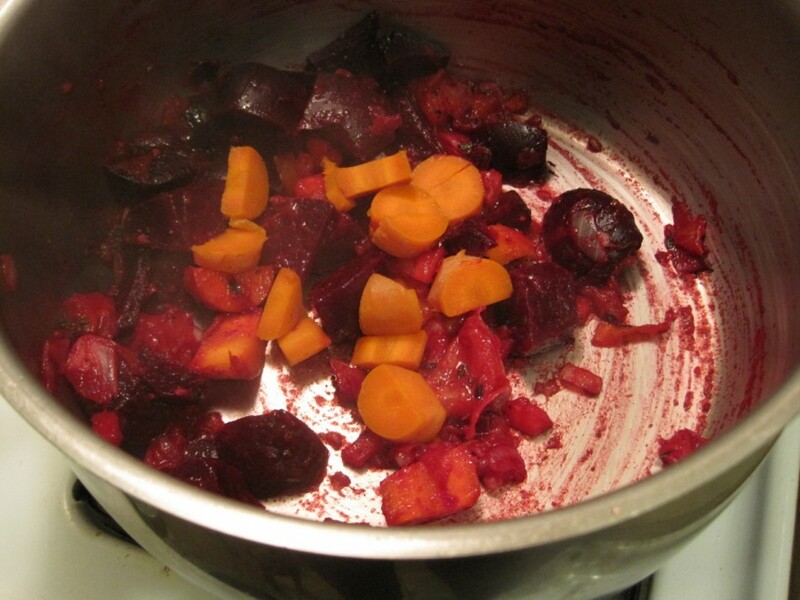 At this point add the chopped beets, and carrot, about 3 to 4 cups of water, and a teaspoon full of vegetable base. Bring to a boil and reduce to a simmer for about 20 minutes or until the carrot becomes soft. 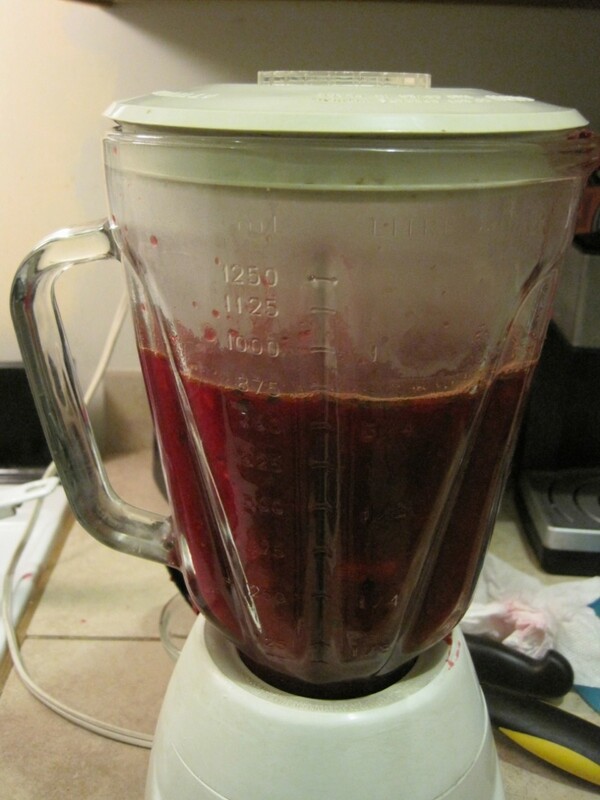 Transfer the soup to the blender, in batches, and puree until the consistency changes. Reintroduce to the pot and warm for a few more minutes before serving. Much like tomato soup, the serving suggestions for this are endless. Shred a little cheese on top, add creme fresh, or basil, or garnish with a thinly sliced radish and a sprinkling of ground cumin powder (as shown). 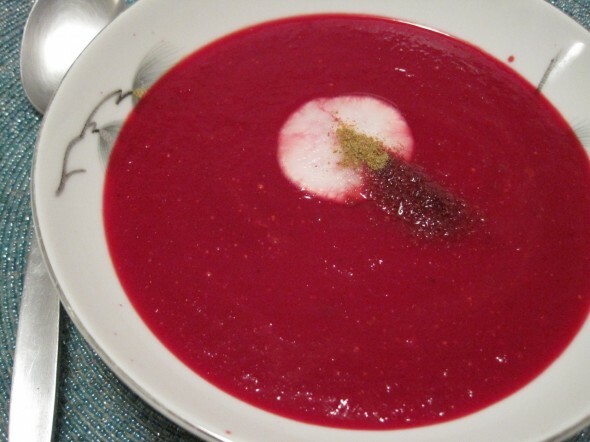 March 31, 2011 | Filed under dinner, gluten free, lunch, vegan, vegetarian and tagged with beets, carrot, dinner, lunch, radish, soup, vegan, vegetarian.